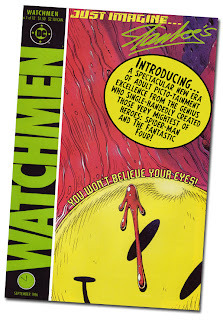 Alan Moore's Watchmen is rightly considered to be the most praised graphic novel of all time. And the long-awaited motion picture adaptation has introduced it to many who had never read it before (it's currently the #1 selling book on Amazon.com). But have you ever wondered what Watchmen would have been like if it were written by someone else? Like, say... Stan "The Man" Lee, co-creator of Spider-Man and Hulk and the Fantastic Four, among many other characters? Comic book writer and commentator Kevin Church recently revisited his 2006 article "Just Imagine... Stan Lee Creating Watchmen". It is a howling scream of a hilarious read!